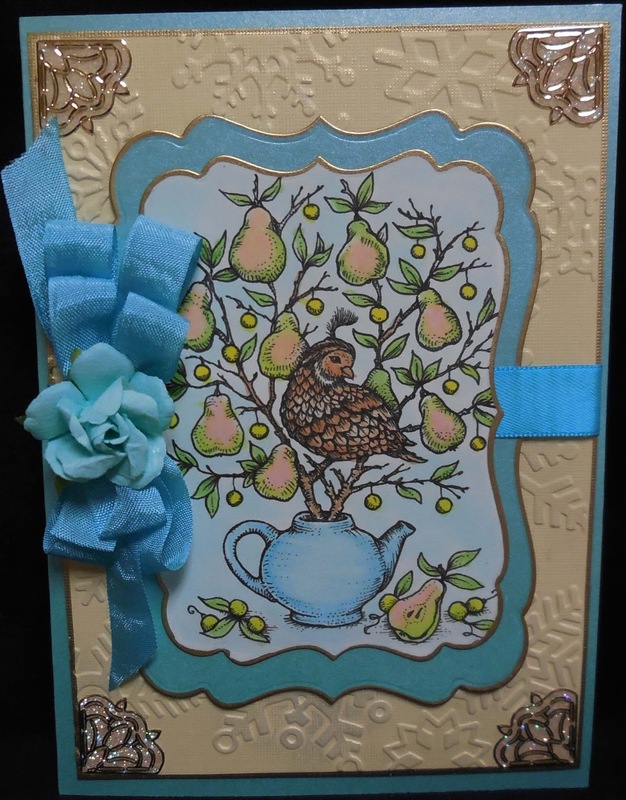 This pretty partridge in a pear tree is a digital image from Power Poppy. I cut it out with some spellbinders dies and edged them with a gold pen. I colored the image with copic markers and mounted them on the snowflake embossed background. I added some gold peel off corners and ribbon and bow and topped it with a flower to match. I'm adding this to the challenge for embellish it. How pretty! I like the coloring and all the gold accents! 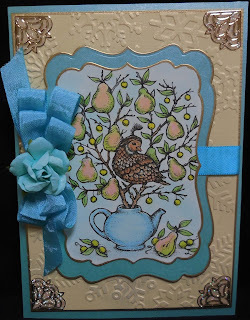 Oh, Karen, I haven't seen a Partridge in a Pear Tree done in these colors — and with such a light and lovely touch to the coloring — it's just beautiful!! Thank you so much for joining us at the Power and Spark Time to Rewind Challenge. I'm so tickled to see your card, really pretty. Very pretty. The hints of silver card stock with the corner accents is wonderful. Thanks for playing in Power Poppy's Rewind Challenge! The blues and yellows look so pretty with this design Karen. Lovely entry into our Power and Sparks Challenge. Thanks so much for playing along!